It’s always a bit of a shock when you get either a retweet or an @reply from someone you don’t think is watching. Been there, done that, damned proud of myself for it. 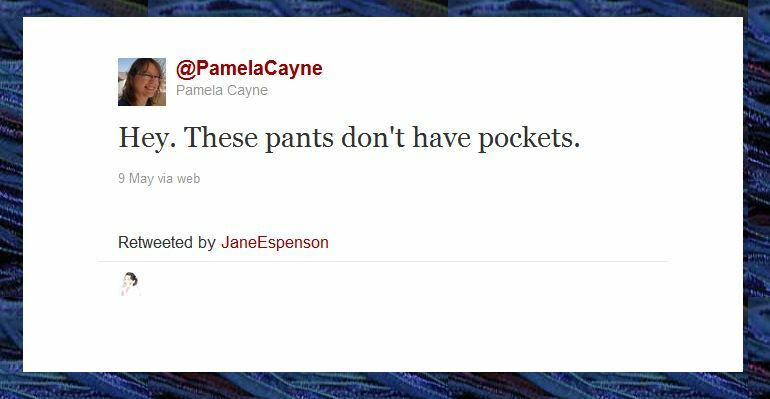 And really, there needs to be a law or something about all pants needing pockets. LOL, Pam!! I would totally NOT have gotten that it was a Star Trek reference… But Jane E. is cool. Almost as cool as you ;). Pam, I’m so sorry I don’t have time to Tweet and don’t do Facebook. That means this is my only lifeline to you!! My luck, I’d tweet about my pants and get the pervs out in droves. That’s cool! Even though I’m not on Twitter, it sounds like you’re a pretty awesome Tweeter. Which makes sense, since you’re a pretty awesome person. (Is Tweeter even a word?) Anyway, I’m sure that’s not the last time you’ll be retweeted! Keep us posted!